Click on images or titles to zoom into larger view. Oil on Canvas 33" x 24"
Mary's love for a past era seen in old black and white photographs has inspired this painting. She wanted to show the cool winter in this painting so she chose a cooler palette of colors. She used expressive brushstrokes to express this feeling and to help tell the story of a young woman bringing her eggs to the store to barter for other things she had need of. The women in this era were getting ready for an event. This was a time when it was common for young women who werent married to live together. Mary illustrates the romance of this time in their clothing, furniture and hairstyles. Her desire to leave room for the viewer to imagine what the story in the painting was, what they might be getting ready for? . . . a letter from a relative or a special friend? The cool colors of purple and green seemed to be just the right accents to express this feeling and the thoughts that go with this time of leisure. 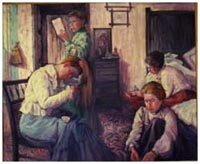 Through this painting Mary recalls the stories passed down from relatives about how things were at this time. 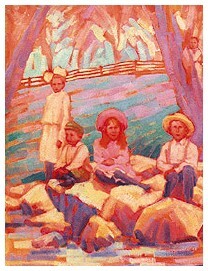 Oil on Canvas 11" x 21"
In this painting Mary used a palette of colors that that would express the hard times of this era. This was a time when people knew their neighbors and helped each other. She saw three men in front of a store not knowing the future; their social standing didn't seem to matter now. You can only imagine what they did, why they were there and what they might be thinking. Oil on Canvas 29"x 23"
Mary paints with a fresh new style where she is the one who decides what to paint and how she wants to convey this in her paintings. Here she chose to use spring colors to express the season. 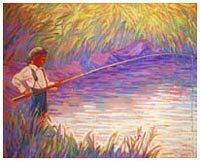 She designed the grass to direct attention to the boy fishing. 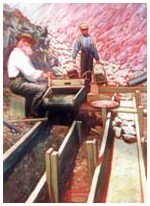 In her painting, Goldminers, Mary is illustrating men at work with the dream of finding gold. Marys choice of hot colors was because it was hot and dry in this area of Yreka, California during the Goldrush. She found these people very interesting. With the help from information given to her on the equipment the miners used Mary was able to render not only the feeling for this era and the people who mined gold, but, also the tools used and obstacles and hardships they had to overcome. 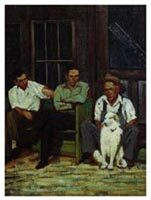 Mary used large expressive strokes of paint on canvas; expressing the story of the goldminers and who they were. Rough, rugged, hardworking men who lived without the conveniences of modern machines or the luxuries of the city. 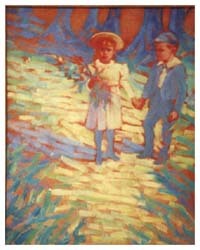 Oil on Canvas 12" x 15"
Mary was inspired from an old black and white photograph of two children in a forest to paint this. She tones most of her canvas before beginning a painting and does sketches to decide how to express what she saw in the photograph, the innocence of children of a past era and the stiff clothing they wore was accepted, the gestures on their faces say what the thoughts might have been in their minds. 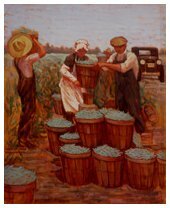 In this painting Mary took an old photo of people harvesting beans and redesigned it. By adding, moving, and removing objects and people around not being confined to what the photograph had in it she is able to create a painting that tells a story. Mary wanted others to see what she saw in the photo as she imagined people working hard, each one doing his part in harvesting of the beans. The barrels, barrels and more barrels of green beans, the truck, the fields of beans, the people with their different hats and clothing all help to tell the story of bean harvest. Oil on Canvas 28" x 26"